There’s something new and exciting brewing here in Southern California: Los Angeles County will be holding it’s inaugural Los Angeles County Air Show on March 21 – 22 at the William J. 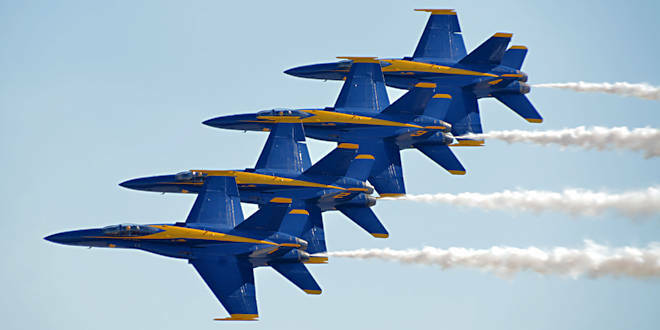 Fox Airport in Lancaster, and the feature performers will be the U.S. Navy Blue Angels. Booyah! Also scheduled to perform is the Red Bull Air Force featuring 5-time U.S. National Aerobatic Champion Kirby Chambliss in his Edge 540, Chuck Aaron in the Red Bull Helicopter, and the Red Bull Air Force wing suit flyers. The list of performers will grow and the Air Show website will be updated as it does, and I’ll be including new information in this blog too. I’m more excited that usual about this airshow, but not for reasons most of you would guess: There seems to be an unwritten rule that air show venues will always have the spectators facing south which means they’ll be looking at the shade side of the planes as they fly by. That isn’t a big deal if you’re just watching, but it gives us photographers fits because we’re essentially shooting photos of silhouettes against a bright background. But the William J. Fox Airport breaks the rule! Spectators will be on the south side of the runway facing north and that means we get to see the sunny side of the planes as they fly by. Things like that tend to excite photographers like me, and so it is.